The DRM12 is a 12″ control-feed drum chipper with a 20″ pivot style side feed roller that is powered by a 32.2 cu in. motor. 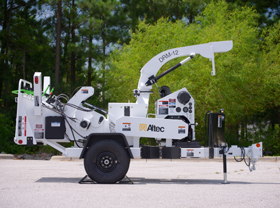 It also features an Altec Controls electronic feed system to optimize the feed control process. 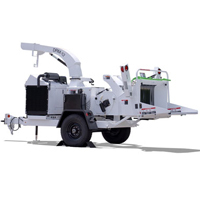 The DRM12 offers a rear tire changing jack attachment, standard lift cylinder, hand crank chute allowing 360° rotation and hand crank height adjustment. The patented Panic Bar is standard and available in green or red.